Hi, dear everyone! After several rains, Beijing started suffering heat wave again. However, I’m lucky to serve Heather and LIU Shengjie here last week. Heather came to attend a one-week course, and LIU Shengjie prepared of his visa to US for a conference. They both do a great job! Besides our research talk, we went to a rap show together, and we visited around Beijing Botany together. In short, we had a wonderful time! And I heard lots of great news of you guys in XTBG. So, today I would like to tell you a good news of LIU Yongjie, Jimmy! Jerry is a small man, but often with a loud voice. He is good at long-distance announcement, which always shocked Orr. His typical dress is T-shirt in orange, or a long sleeve in camoflague. Jimmy is a helpful person. There is one thing I remembered markablely. That’s when we were in the pomelo forest, the sun was burning, and we worked a whole day. Everyone of us was exhausted, like bathing in sweat. At the time we began to go back, I found I left my bag somewhere, LIU Yongjie just ran back and helped me find it, which made him drip sweat and slight sunstroke. 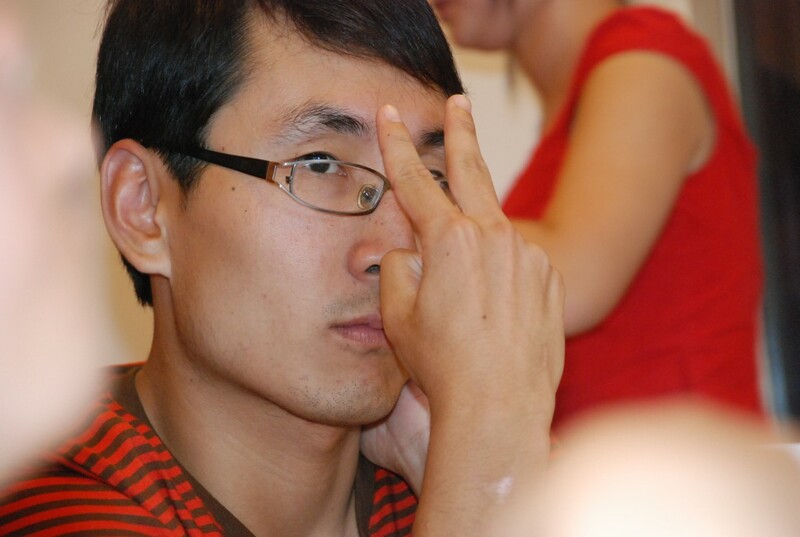 I heard that Jimmy already finished master degree in XTBG and will go to Zhejiang University for his doctor degree. He is the only person who successfully passs the doctoral entrance exam among all the people in XTBG. Besides this achievement in academy, Jimmy met his special girl during his oral quiz! Hoh, what a wonderful fate! Hope everyone have the good luck as Jimmy! This entry was posted in Afec-X, personal and tagged pomelo, XTBG on 2010年7月25日 by gracedou. Hi, everyone. Yesterday there finally was a rain in Beijing, cooling down the extremely high temperature here. I’ve stayed in office all day long, like a hibernant bear, the only difference between the bear and me was that I still keep eating during my hibernation. What about you, guys? Are you suffering the weather too? This time let’s talk about WU Kai, the rain boy! 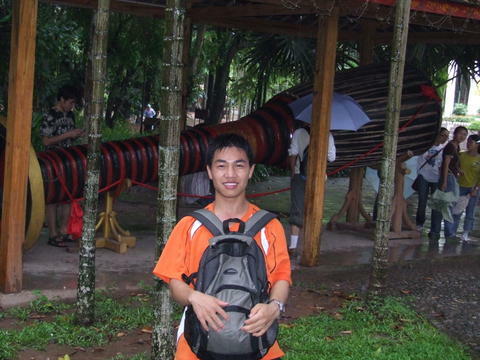 Kevin is a doctoral candidate of Wuhan Botany of Chinese Academy of Sciences. I remembered his hometown is Yunnan Province, and he finished undergraduate in Yunnan too. So he is half host when we were in Kunming, taking us to the famous cross bridge rice noodles, and helping Bhakata deal his visa problem. For all of us attending this course, English is not a first language but today i witnessed something wickedly funny. I entered the EcologicalEvolution lab and saw this young scientist (AFEC-X participant) staring with the greatest concentration into a microscope. Underneath the lens was a tiny spider. There was light perspiration on his forehead as he struggled to analyze the specimen. Suddenly a smile broke out on his face and he nearly punched the air as he exclaimed. IT’S A BOY!!! Well, Kevin has a nick name “Rain Man” in our spider group. When in field, we use a plastic pipe to inhale spiders, so there would unavoidable be some saliva in the pipe. But there was like hundreds litre in Kevin’s pipe! And Kevin liked swinging this pipe, which made his saliva flow everywhere, just like it was rainy! So Yen used Rain Man to call Kevin. It’s a very vivid describe. And Kevin once asked HUA Xia, a girl, to buy him a swimming suit, it seemed very inappropriate…. Hope Kevin will do great in Wuhan, with his doctoral dissertation! This entry was posted in Afec-X on 2010年7月11日 by gracedou. Hi, guys. It seems Dodo had disappeared for quite a long time, but now she decides to restart writing again. Well, first I want to tell you an intersting story. One day I received a e-mail from a totally stranger. His name was Tarbish and he found my blog of Navendu through Google, which “summarized very well Navendu’s character, and the place he has in other people’s heart“. Tarbish has never met Navendu, but they exchanged mails for identifying flowers at the webpage http://www.flowersofindia.net. He said my blog help him find the various mode of Navendu, which made me very happy and decided to keep writing, describing all of you in Afec-X! OK, this time it would be WU Lan and CAO Zijuan, the “two girls” as Orr always called. WU Lan and CAO Zijuan are both from Peking University, one of the best universities in China. They major in biology, especially on wildlife protecting. The characters of their major make them running around, living in field for months, watching pandas mating, etc. It’s an amazing major, which I always dream about, but claims both healthy physical and emotional conditions. The two girls are from South China, appearing beautiful, slim, tender, whose occupation you might consider as teachers or nurses. Well, at least it’s my first impression about them. But as course going, I found them really powerful in the field. Really powerful women! 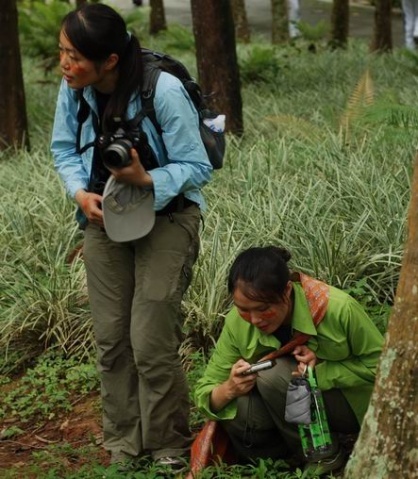 Once we were in the rubber plantation, there are a lot climbing and downhill, I was after CAO Zijuan in the line, she climbed facilely through the way I would never try. WU Lan is amazing too, she gave us a lot of surprises, a fresh jackfruit as dessert for dinner, picked by herself from the tree for example. WU Lan is good at photographing too, her camera has a large lens. I though she once snap a picture of mine, when I was seriously discussing the independent project with Chuck at the rubber plantation. WU Lan promised to post that pic to me, I guess she has forgotten this for a whole year and still forgetting it…. 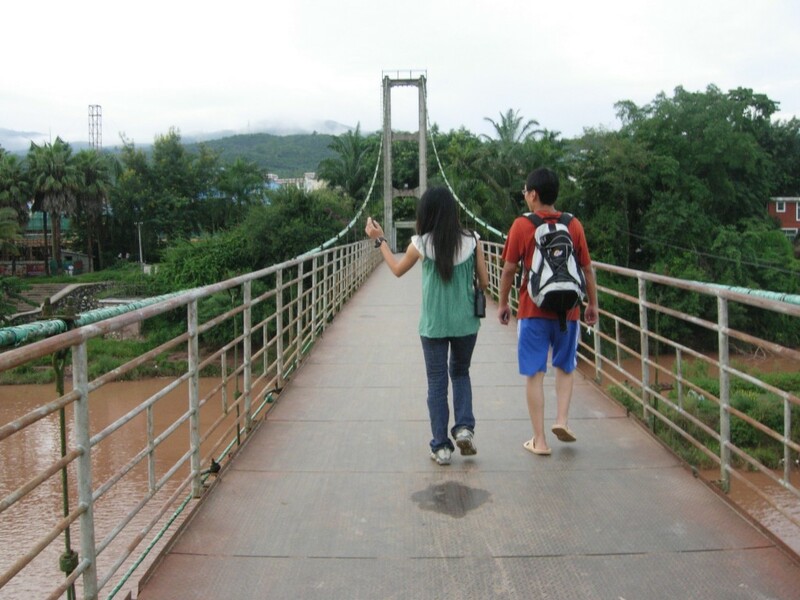 The most amazing thing about two girls happened on the last day we spend at Xishuangbanna. After the crazy party we had, they and LIU Yongjie (Jerry) and another boy rode on two motorcycles, running to the pumelo forest in the midnight, climbing up to the pumelo trees, picking as many pumelos as filling a whole gunny bag! Then each room of ours had a fresh pumelo! We had a pumelo party! After our course, WU Lan and her family went to Tibet from Kunming. I believe she must enjoy the field and take a lot of pictures! I’m not a big fan of football, but after yesterday’s game between German and Argentina, I decided to support German as much as I can! 4:0!! Maradona, you could sing “Don’t cry for me, Argentina” to confess, instead of streaking! This entry was posted in Afec-X, personal, Uncategorized and tagged Afec-X, Peking University, Rubber on 2010年7月4日 by gracedou. Now it’s Jer Pin’s turn. 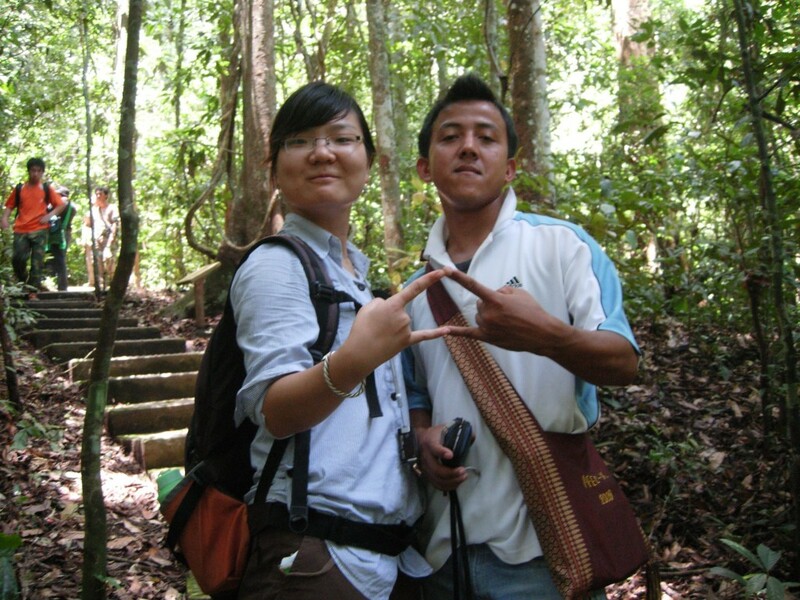 Jer Pin Chong is a Malaysian, currently working in a Molecular Ecology lab in Utah State University, U.S.A. (from his blog). He can speak fluent Chinese besides Malay and English. And, yes, you are right, that’s because his ancestors are from Anxi County, Fujian Province, China，where produces the famous Tie Guanyin, a variety of oolong tea. BTW, I once asked my friend to guess his nationality; and the answer is “South Korea”. I think the reason might be that Jer Pin looks really international…. Jer Pin’s self-introduction deep impressed me, even five months passed away, I still remember all the details. Firstly he emphasized he is at least five years older than we thought. Before that, we all considered him the same age among us, 22, 23 or 24 at most. It turns out his real age is 28 years old!! Oh, man, it really shocked. All girls want his secret to be young. Secondly, he said he is skinny. Ok, that’s a easy-found out character. He looks exactly SKINNY, no wonder Yen called him a skeleton. Jer Pin is a funny person and knows how to present his humor. When on his first presentation, he asked us if we thought it was too long, we could give him the gesture of “cutting one’s throat”. And on the last presentation about the independt project, he made an advertisement of their equipment, said that if anyone wants to know sth about their water-depth detection, please contact them, it’s their patent. Also, when at a chat, I asked Naya and Yen to give their MSN to me, JerPin said: you can talk with each other face to face now, why do you need a MSN? 囧…. Well, Jer Pin has been choosen as the will-be most successful scholar at the end of Afec-X, due to his preciseness, aspiration to knowledge and effort. Jer Pin is scerious about academy. I once were in the same group with him at the field. He labeled and I recorded. He asked me to write down every information, and made a special remark if we could not make 100 percent about the species. I didn’t understand why and thought he would be too rigid. He said ” My job is detecting the gene sequence, sometimes it takes our several days to find out a error was due to the wrong samples, which orginal comes from the people’s careless who collect samples at field. So, if we do this more carefully, it will save people in lab a lot of time.” And I once saw his records of their independent project, which was really explicit. Moreover, he is not only disciplined in research himself, but also advices so to his friends, Yen for instance. That’s what the characteristic I need to learn from him. For his life style, Jer Pin likes eating cookies and bought two bags of cookies with him back to U.S. His literary interest is reading horror fictions, such as Cai Jun’s series of 荒村公寓 (Mason of Deserted Village )……. I like this photo very much, I think Jer Pin is enjoying Bhakta's feet. 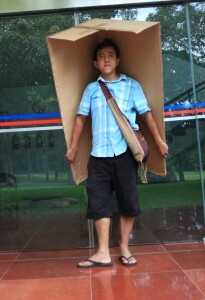 This entry was posted in Afec-X, personal and tagged Afec-X, Jer Pin, Malay on 2009年12月27日 by gracedou. 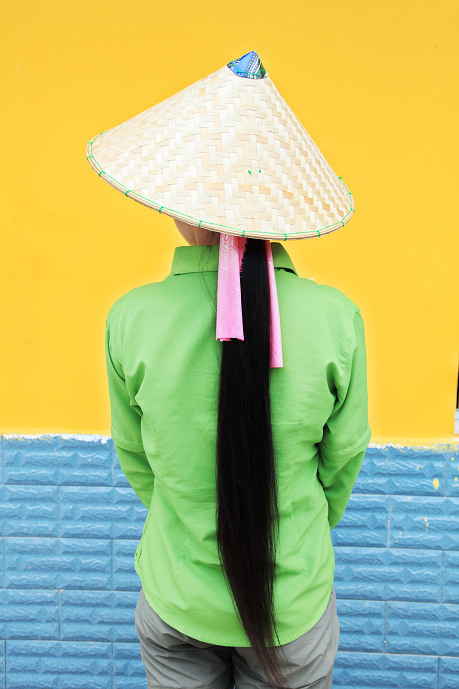 Orr is a girl from Thailand. Her name is Jitwadee Khoonwongsa, a little bit long and complicated for us, so she let us call her Orr for short. We are in the same age, so we share many things in common, like the same style of earrings. I guess the greatest characteristic of Orr is that she likes drinking beer very much and she drinks beer everyday. At first I was a little bit shocked about her habit, but cold beer is a really good choice in hot Xishuangbanna. However, I’m still not good at drinking beer, but Orr is really good at it. And due to the beer thing, she gave the nick name “Baby dog” to Navendu cause he refused beer. Orr is a good looking girl, but actually she is like a guy, strong and boyish, which we could tell it from her favorate beer. She has a watch, a boyish watch, which shoulc be described as cool rather than cute. And she looks good in the field suit too. She has been observing birds in the field for a long time. It’s not easy for a girl to undertake this work. I think I should learn from her. Orr has good taste in dressing. Every girl in Afec-X made a suit of Dai dress, and all my friends believe her suit is the best. They even described my suit as ” the tast of country girl”, but her suit as ” elegant” …. Well, that’s true…. And Orr is naughty too. She is good at taking photos and she does take a lot of wonderful pics, such as Sleeping Navendu, Carla in a nap and Eating Zhang Minggang…. She could catch the wonderful moment and shoot the pics. What could I say, such a naughty girl who brings a lot fun to us. Let’s review these moments and enjoy! Everytime I catch her on MSN, she is at work, such as still papers for reading or works to do. I know she is really good at her study, but hope she could manage all these things better, and look into the bright side of work, people and life. This entry was posted in Afec-X, personal, Uncategorized and tagged Afec-X, mango, Orr on 2009年12月20日 by gracedou. Hi, guys, today we are going to talk about Liu Shengjie, the boy who always asked about “Money!”. Hohoh. Liu Shengjie is a boy from Hebei Province, China. He is always sunny, but sometimes quiet, especially in lecture time. Well, I think the most primary character of Liu is that he likes offering help, but first giving you a complain. For instance, I asked him for accompanying me to catch spiders, he said “oh, it’s too hard”. But actually, I knew he would offer help after all these complains. And the truth is, he went to the rubber with me that night and we went through a heavy rain. Thanks, Liu. Liu is a really nice guy, and we all like making fun with him. At the beginning, we made jokes between him and Jer Pin. Then we made fun of him with Orr. I don’t know why we could always have materials for us to make fun too. Maybe that’s just another evidence to prove him a nice guy—helping us to be happy. Oh, sorry, Liu…. The last days of Afec-X, he had to go back home cause his mother was sick. The last time I saw him, he seemed really upset and worried. That’s because he is a good son. Luckily his mother got better. Hope your mother will be healthy and live long. 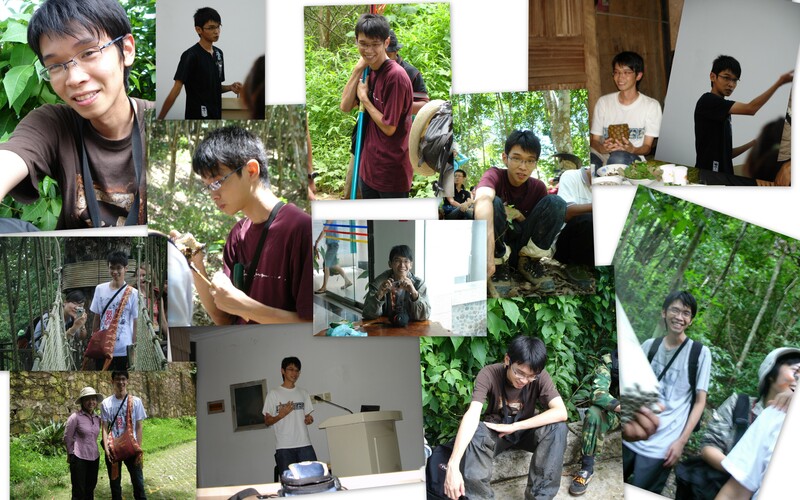 Liu, hope we will meet again, cause the goodbye we said was too rushed. And hope your mother and all your family will be healthy. 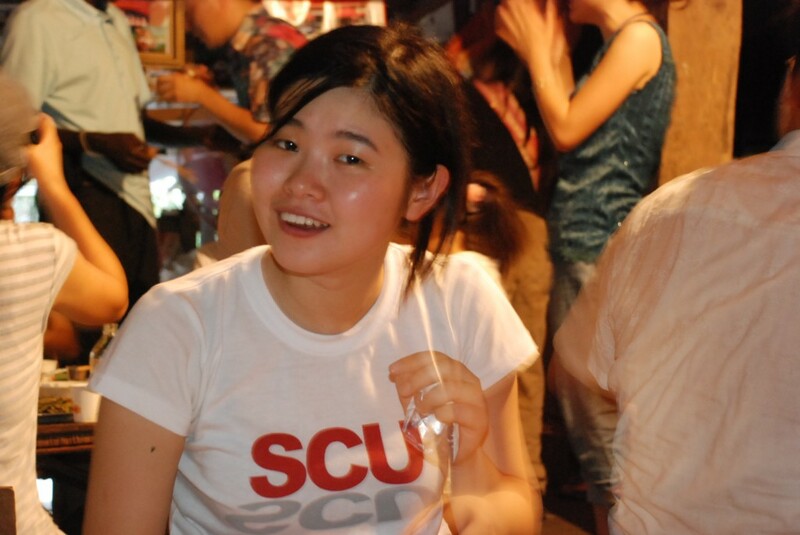 This entry was posted in Afec-X, personal and tagged Afec-X, Liu on 2009年12月13日 by gracedou. 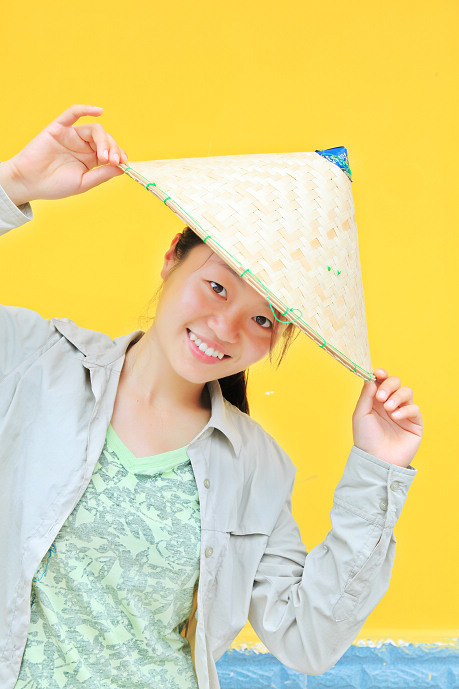 Carla is a girl who is a little bit older than me –but the same age with HuaXia, and comes from Philippines. After she got her balcony degree of biology, she worded for a year then decided to study further on masters’ degree. I remember her self-introduction clearly even so many days have been past, cause it is a really brilliant self-introduction. She said she wants to get a degree on ecology and conversation, which could combine her favorate thing-travel-with work together. And she served for a NGO once, traveled to many places. Besides this, she loves children and could get along with them well. I still can remember her photo of balcony degree she showed to us on the self-introduction, with the long hair and beautiful smile, Carla looks so gentle and elegant. Carla is a very hard working student. Afec-X gave us many works, such as reading materials and writing the proposals. Carla didn’t bring a laptop with her, so she had to go to library for the public computers. Though it is so inconvenient, she finished reading all the papers Chuck gave us and worked out a great proposal. And she sat in the very front of every lecture, taking notes carefully and asking questions. So she got the Prize as “Most Hard Working” Award! Carla’s oral English is extremly wonderful, which I think is the best among all our girls. She uses the word “powerful” to describe my high-heels. And asked us “Am I looked rich now?” with the glisten braclet. Because she is the first Philippines I came acorss, I could not tell whether it is because of a Philippnie or because of herself. Besides oral English, she writes blog in English fluently. When I read her post ” On the Way Home”, telling us her experience about rushing to airport and getting the chance of sitting in the first class, I can’t help but laugh. What a brilliant story teller! And Carla is good at playing with children, also, she enjoys playing with children. The four babies at Afec-X are very cute, and all of us like them very much. But Carla is the only guy could get their favorate impression. I like them too, but I don’t know how to get along with children, so although I wanted to play with them eagerly, I didn’t know what to say, what to do. But Carla is really good at this, she understands what they want, what they like, and they all like to play with her too! How amazing! We once talked about going abroad for Ph.D, and she hadn’t yet decided. Well, in my opinion, Carla, you have passion and the will, you should go outside for further study! Good Luck! 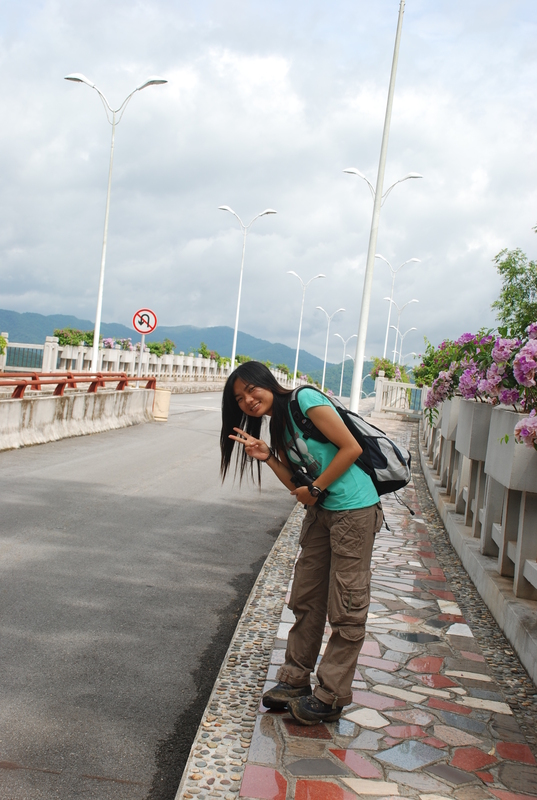 This entry was posted in Afec-X, personal and tagged Afec-X, Carla, Philippines on 2009年12月6日 by gracedou. 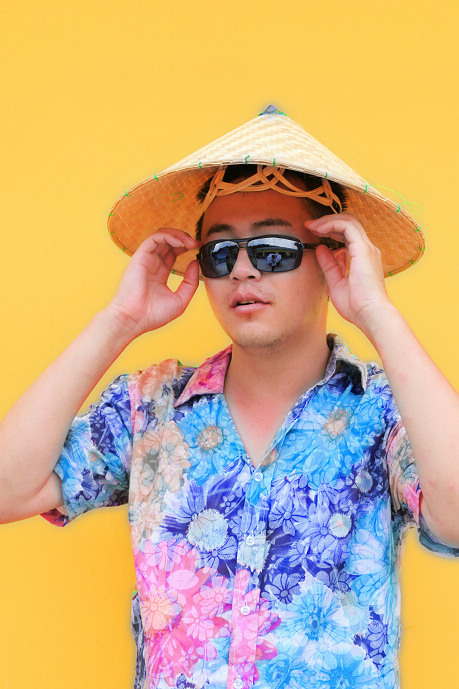 FAN Huan, whose English name is Heather, is this week’s person. I knew Heather before this course, because Heather and I joined the same broadcasting organization, we broadcasted news every Thursday night. Of course, it is not professional, but we enjoyed it very much. 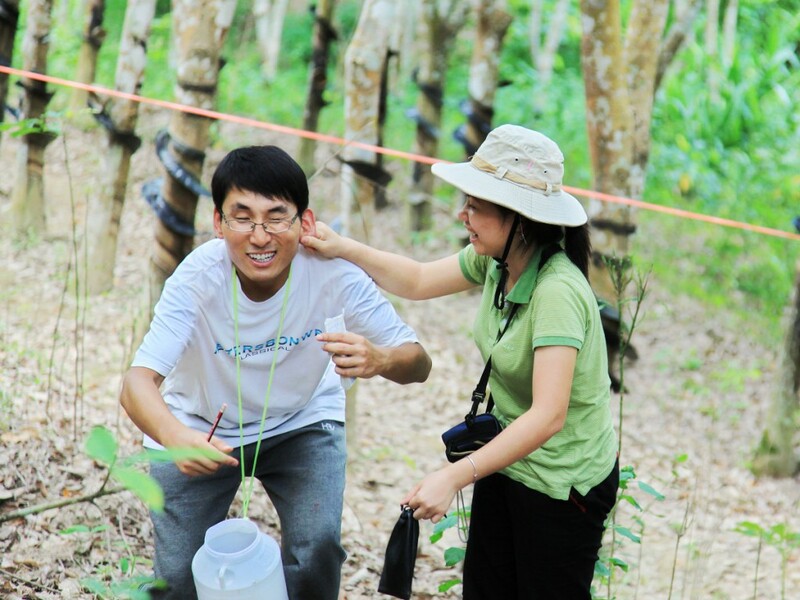 And we choose a same course, Forest Ecology, which makes us become good friends. She is the special person I should thank to, cause she is the one who gave the news of this course. If there is no Heather, I cannot be in XTBG, knowing so many fantastic people. So, thanks, Heather. all colleagues in front of radio station, can you recognize Heather and I? Heather is a girl who has magic to make everyone likes her. She is humorous, remembering all the funny plots in Friends and using them at hand. The last night at XTBG, we talked about the age issue, then Heather said once Joey in Friends wearing big clothes and saying “Hey, Buddy!” to act as a teenager. Well, her act was very funny and exactly the same with Joey!! With many years practice of violin, Heather is great in music. She plays violin great, and sings great, with great passion. She has a sensitive feeling about art and aesthetic, which also shows out in her dress style. I like her personal dress style very much. Heather is also sensitive in academy. She is interested in many disciplines, especially the plant taxonomy. When we were in Beijing, she once explained the differeces about beach blossom and plum blossom to me, but, unfortunately, I couldn’t fully understand the sepal, or the pistil. hohoh, hope Heather would do even greater in her study. This entry was posted in Afec-X, personal and tagged Afec-X, Heather, Violin on 2009年12月6日 by gracedou. 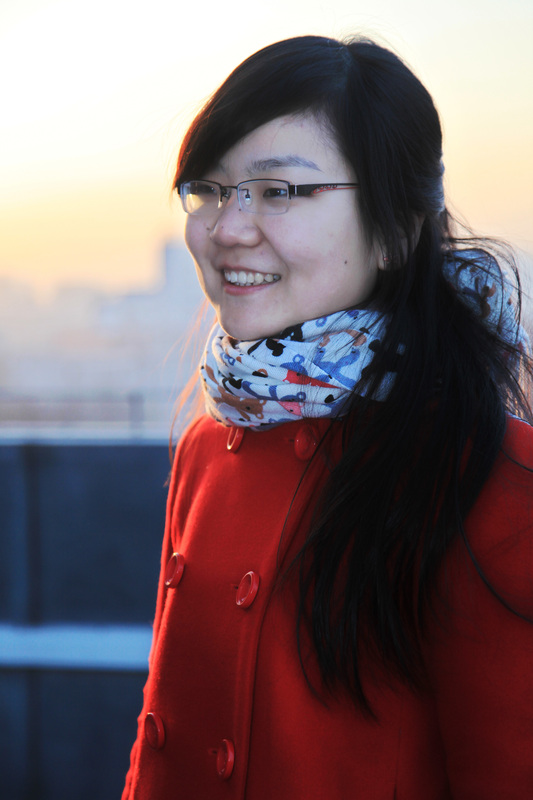 Mo Xiaoxue is a doctoral candidate in XTBG. She comes from the famous “Beauty City”, Chongqing, and she herself is very beautiful, a pair of big eyes on the a pretty face and with a plait on one side. The most staring character of Mo is that she is good at taking photos. She has two appareil photo reflexs and countless scenes, and she knows every aspect of parameters about cameras. However, the most important part is that Mo has a creative thought and sensitive feeling about beauty. She could find a unique angel of normal view and present it as an amazing photo. 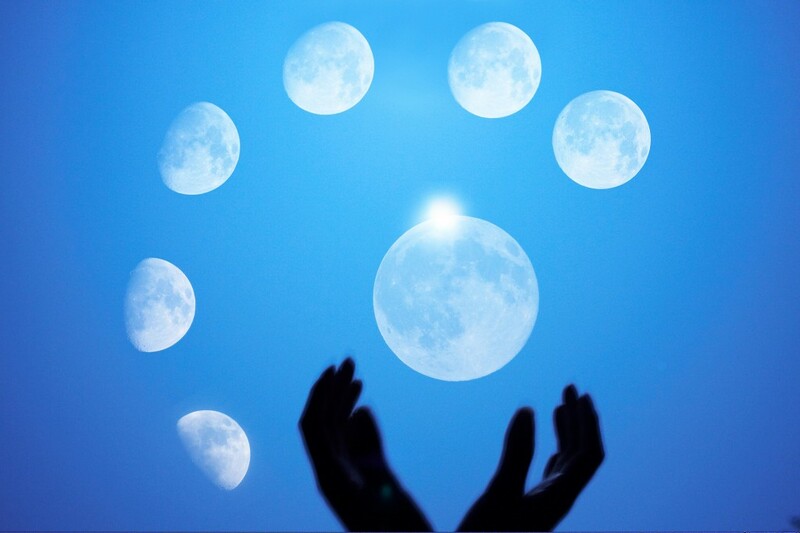 The photo which most impressing me is the one that her hand carries several moons. I think this idea is brilliant. And two weeks ago, cause there was a meeting held in my institute, we needed one photo to make a background panel. So Mo is the first and only person I asked help for and she has not let down. She gave me one great landscape photo, even the size is perfect for the background panel. Although Mo doesn’t like reading papers, she is smart, and can always find the creative point to do further study. One of her own projects is to study the coffin material of a minority ethnic group, which is a unique plant species. This idea is very innovated and full of cultural ambience. I hope I can have that kind of innovation. yesterday I went to visit Mo and Deli, we had some red wine at the balcony and Mo took a portrait of me, which I like very much. This entry was posted in Afec-X, Uncategorized and tagged Afec-X, Chongqing, Mo, photo on 2009年12月6日 by gracedou. Long time no see, then this time I decide to write something about my great partner Bhakta. Bhakta, as he wrote in his own blog, is a young mountain forester; and his ultimate goal is to be a pure Natural Resource Manager. Bhakta comes from the foot of Himalaya, and served a NGO to do some experiments on the majestical mountains. He got his masters’ degree at Austria, and I guess he now is in Canada, to continue his study on Ph.D. He has passion and does really great on his major. He devoted himself for the ecology thing. Bhakta is a fashionable gentleman; he has the “hip-hop” spirit and life style. He walks like a hip-hopper, he talks as singing hip-hop, especially the Bhakta Brand “hey, Gentleman”! After a while, all people in spider group used to begin a conversation with “Hey, Gentleman!” no matter it is girl or boy. Bhakta is really good at searching literary. He knows well how to use the Internet, and how to find the perfect keywords. On our first independent project, he found several very useful papers for Mo and me. Besides the searching ability, he could organize the information we found from Internet, and write a good essay in few hours. As he said on his blog, he found Afec-X information on Google, and applied after the DEADLINE! Then after getting the accepted letter, he got the grand from WWF, to support the fly ticket! What a lucky dog! But he deserves this, cause he is such a hard-working young guy and good at information searching. I have to say sorry to Bhakta. Because of my persistent on the close range photogrammetry project, he had to suffer unfair arrogant and temper from me. But he never complained. A great partner! Hope you enjoy your new life at Canada, Bhakta Gentleman! 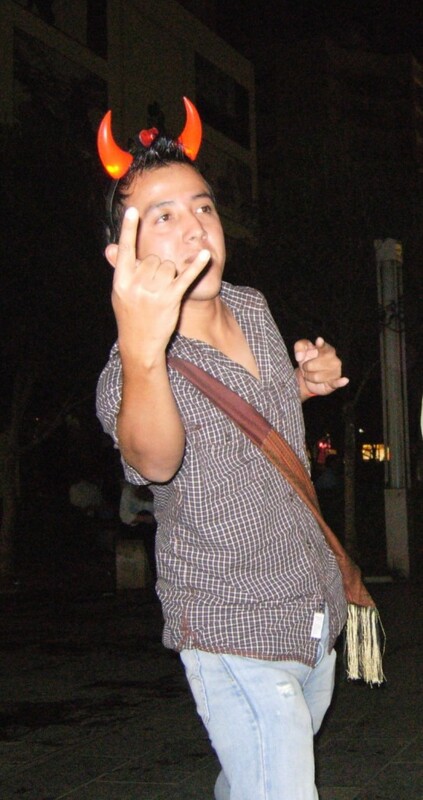 This entry was posted in Afec-X, Uncategorized and tagged Afec-X, Bhakta, Nepal on 2009年12月6日 by gracedou.